From the impacts of U.S. Supreme Court Omnicare and Halliburton cases to the uptick in Securities Act class actions, litigation partners Scott Musoff and Susan Saltzstein discuss the latest securities litigation developments. What were the most notable securities or credit crisis-related litigation trends of 2015? Scott: The pace of federal securities class action filings increased last year, with over 180 class actions filed. While this number is slightly lower than the annual average between 2005 and 2014, it actually represents a higher percentage when compared to the number of public companies, which has decreased. Thus, the chance that a public company will be named in such an action is similar — if not higher — than prior averages. Also, accompanying the uptick in initial public offerings in 2014 was an increase in Securities Act cases filed in 2015. In some jurisdictions, these cases can be brought in state court and will not appear in the federal filing statistics. In bringing Securities Act claims, plaintiffs have relied on allegations in connection with Item 303 disclosure, which relates to trends that are known to management and are reasonably expected to have a material impact. Plaintiffs also have been pursuing Securities Act claims when an IPO occurred at the close of a quarter but that quarter's financial statements had not yet been issued. In defending these cases, it’s important to put the alleged trends and results in context, which may defuse the inference that there was an undisclosed trend known to management. As we predicted at the end of 2014, the median number of cases settled and the settlement amounts increased in 2015. Also, as expected, the number of new credit crisis-related litigations declined as statutes of limitations expired. However, there still are a number of existing cases percolating through the courts, and we may see some trials in 2016 relating to both residential mortgage-backed securities "putback" and misrepresentation cases. One of the biggest developments in 2015 was the Supreme Court's Omnicare, Inc. v. Laborers District Council Construction Industry Pension Fund decision. What is the significance of that case and how is it playing out in the lower courts? Susan: Statements of belief captured the Supreme Court’s interest in Omnicare, which led to a new test for assessing whether statements of opinion or belief in registration statements are actionable pursuant to Section 11 of the Securities Act. Justice Elena Kagan, joined by six other justices, vacated the U.S. Court of Appeals for the Sixth Circuit’s assessment that a statement of opinion could be actionable under Section 11 if the opinion later turned out to be untrue, regardless of the speaker’s belief in the statement’s truth at the time it was given. The Sixth Circuit's standard was far afield of the standard adopted by other circuits that had assessed opinion statements in the Section 11 context over the years. The Supreme Court’s analysis injected an objective standard into the assessment of whether an opinion is actionable based on claimed omissions. Ultimately, the Court determined that to steer clear of Section 11 violations, "an issuer need only divulge an opinion's basis, or else make clear the real tentativeness of its belief." And even if an issuer does not do so, to establish liability, plaintiffs must be able to point to specific material facts whose omission makes the opinion misleading in light of the registration statement when read fairly and in context. 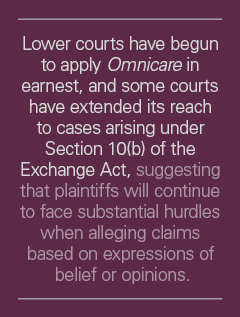 Lower courts have begun to apply Omnicare in earnest, and some courts have extended its reach to cases arising under Section 10(b) of the Exchange Act. This application of Omnicare by lower courts suggests that plaintiffs will continue to face substantial hurdles when alleging claims based on expressions of belief or opinions. Scott: This is certainly one of those cases that would have been really harmful to corporate America, had it gone the other way. The result brought the Sixth Circuit more in line with the U.S. Court of Appeals for the Second Circuit and others. Another important case was Halliburton v. Erica P. John Fund, known as Halliburton II, decided by the Supreme Court in 2014. The impact of that case is still being sorted out. Can you discuss the key developments there and any other important lower court decisions from 2015? Susan: The 13-year-old Halliburton saga continued to play out in 2015 in the Northern District of Texas, where the court grappled with how to apply Halliburton II. Halliburton II reaffirmed the fraud-on-the-market presumption and clarified that defendants must be allowed to rebut it at the class certification stage by demonstrating that each alleged misstatement did not affect the stock price. Halliburton II followed the Supreme Court's 2013 decision in Amgen Inc. v. Connecticut Retirement Plans and Trust Funds, in which the Court held that a class of plaintiffs was not required to demonstrate the materiality of alleged misstatements before class certification because it did not bear on Rule 23(b)(3)'s predominance requirement. In Halliburton II, however, the Court distinguished Amgen by noting that, unlike the materiality of an alleged misstatement, price impact informs the issue of predominance at class certification. It remains to be seen how lower courts will square Amgen, which precludes courts from examining materiality of alleged misstatements at class certification, with Halliburton II, which requires courts to allow defendants to demonstrate a lack of price impact (which would seem to be indicative of materiality), especially since Halliburton II declined to address how a defendant could show this impact. On remand, the Halliburton district court tackled that gap. The district court weighed the evidence submitted by the parties and the arguments advanced by their competing experts, especially the use of event studies. The court focused on the experts' use of confidence intervals, requiring the plaintiffs' expert to demonstrate with 95 percent confidence that the alleged corrective disclosure impacted price. The court found that Halliburton's expert demonstrated that the plaintiffs' expert failed to meet the standard for some disclosures. Further, the court rejected the plaintiffs' use of a two-day window for measuring price impact, reasoning that the stock price in an efficient market should reflect a corrective disclosure within a day. Finally, despite claiming it would not consider whether a disclosure was actually corrective, the court refused to find a price impact where the plaintiffs' experts had "demonstrated" one using information previously disclosed to the market. In all, Halliburton won big: Weighing the parties' competing experts, the district court found no price impact for five of the six disclosures. In the coming months, circuit courts will begin to review district court decisions that analyze price impact and other arguments at the class certification stage. The U.S. Court of Appeals for the Fifth Circuit recently agreed to hear an appeal of the Halliburton remand. Additionally, the U.S. Court of Appeals for the Eighth Circuit also will address Halliburton II's contours in a case that was argued on October 22, 2015. IBEW Local 98 Pension Fund v. Best Buy Co. is an appeal of the district court's grant of class certification. Analyzing issues similar to those the Halliburton district court examined, the Eighth Circuit is expected to address Best Buy's argument that the district court incorrectly applied Halliburton II by purportedly ignoring evidence that the supposed misrepresentations had no impact on Best Buy's stock price. Best Buy contends that the alleged misrepresentations occurred during a 10 a.m. conference call and uncontroverted evidence shows the alleged misrepresentations had no effect on its stock price, pointing to the fact that the closing price of its stock that day was virtually unchanged from when the call began. If the Eighth Circuit affirms the Best Buy district court, a potential split with the Fifth Circuit could set the stage for the Supreme Court to revisit price impact in Halliburton III. In addition to these specific issues that are playing out, what are the big-picture trends that could define securities litigation in 2016? Scott: As mentioned earlier, Securities Act class actions in connection with IPOs saw an uptick last year, which is likely to continue in 2016 if the window for IPOs opens. We also have observed an increasing trend of institutional individual actions or so-called "opt-out" cases — cases where institutional plaintiffs choose to pursue securities claims individually or in groups, rather than participate in a class action. This is due, in part, to the Second Circuit's 2014 decision in IndyMac, which held that there could be no tolling of the Securities Act's two-year statute of repose. As a result, some institutions feel they cannot wait until the resolution of a class action before deciding whether to file an individual action and thus avoid the risk of the claims being time-barred. This may be the year we see IndyMac play out in the class certification context as well. We also have observed additional litigation over the meaning of domestic transactions, even years after the Supreme Court's Morrison decision, which held that the anti-fraud provisions of the federal securities laws applied only to securities traded on U.S. exchanges or in other domestic transactions. In a world of global offerings, courts are paying particular attention to whether plaintiffs can adequately allege they purchased securities in a domestic transaction. ‎Both the institutional individual action and Morrison phenomena are evident in the current Petrobras securities litigation pending in the Southern District of New York. In that case, Judge Jed S. Rakoff dismissed certain note claims by foreign investors, who were unable to adequately allege that they purchased securities in a domestic transaction. Finally, as the initiation of financial crisis cases wanes, we predict an increase in more traditional stock-drop cases. Plaintiffs will seize upon volatility in the marketplace as well as any corporate crises, such as cybersecurity breaches, to initiate securities fraud class actions. This article is part of Skadden's 2016 Insights – Global Litigation. "Near-Record Securities Litigation Filings Show No Signs of Slowing"
"US Corporate Governance: Have We Crossed the Rubicon?" "Securities Litigation Developments Largely Expected to Shift From SCOTUS to District and Circuit Courts in 2015"
"Inside the Courts: Supreme Court Decides Scope of ‘In Connection With’ Requirement of the Securities Litigation Uniform Standards Act of 1998 (SLUSA)"
"Securities Litigation Landscape Continues to Evolve in 2014"